I should clarify that I didn't mind the comment about going back to the Pony. I just heeded it because I didn't want to disrupt things further. 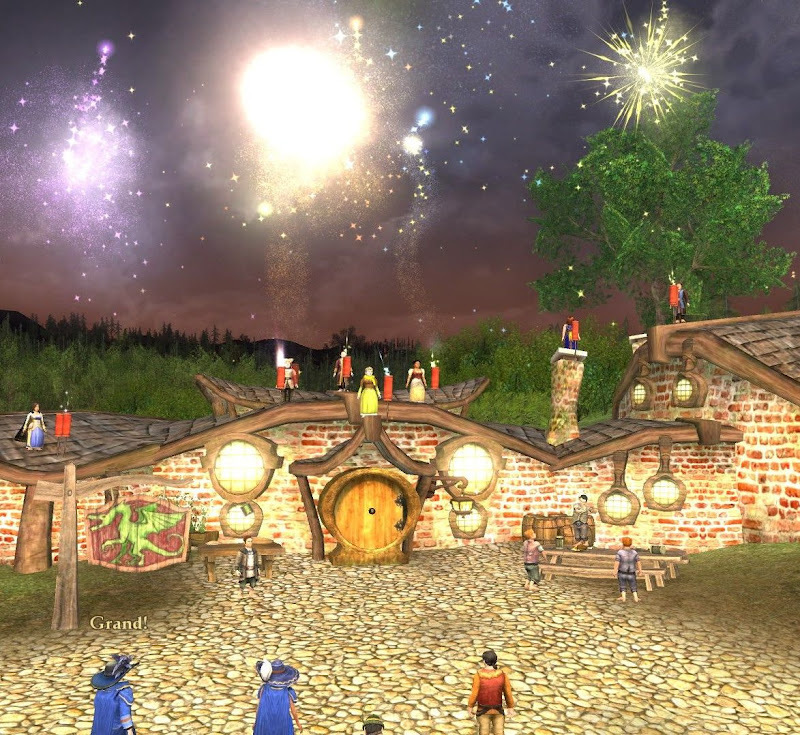 Perhaps one day I'll roll a hobbit and attend another Green Dragon event, because you're all the gem of the server. And I also agree that I've never felt that hobbits are out of place in the events of Bree, but I've also seen elves give up their mystique to lord it up among the primitives that is comparable to an earlier comment about humans coming to stare at the "circus freaks." I'm not completely complaining as I believe the more the merrier, but I only mean I can relate. And I agree that the lore and to some extent immersion (I say "to some degree" because I've seen in the past at other online rpg's people expect much more out of people than they should for the sake of their immersion. To me I consider rp more of collective storytelling than personal immersion, which is to say I'm willing to bend my character, even if it's unfair to me to some extent, to help people tell interesting stories. If one is too focused on immersion they can often forget the bigger picture. I gmed at uo shards and Illarion.org so I may have just developed this philosophy as a tool of facilitating play as a gm.) is important. The last two posters have been very kind and welcoming so don't think this is a criticism to you two (or even the vast majority of players here) but some people use lore as a hammer to bash people's heads in with rather than as a tool for building rp. Maybe someday to quell the curiosity of the tall folk there could be a hobbit expedition into Bree so we can hear all those great songs and poems and hop along with our hobbit friends. I remember these event series used to be more race strict, and members of other races were requested to roll a hobbit instead before attending. Ofcourse I can understand the organizers do not want to bother policing the event. Instead they spend their time on positive things and carry on having fun. I respect the organizers' decision in this, but I think it's a mistake. By making it clear this is a Hobbit Only Roleplay Event and send away an elf for the sake of twenty others, well boohoo to the party pooper. Attention seekers everywhere. Don't give in!! A kind request to please go somewhere else for two hours or log a hobbit, can't hurt to try get it right? It's only for a few hours each friday? Technically speaking, is it so hard to respect a group of people who happen to enjoy roleplaying a hobbit, who borrow the hobbit tavern for only a few hours each week to have their Shire immersion bubble unaffected? How hard is it really, to roll a hobbit for the occasion? 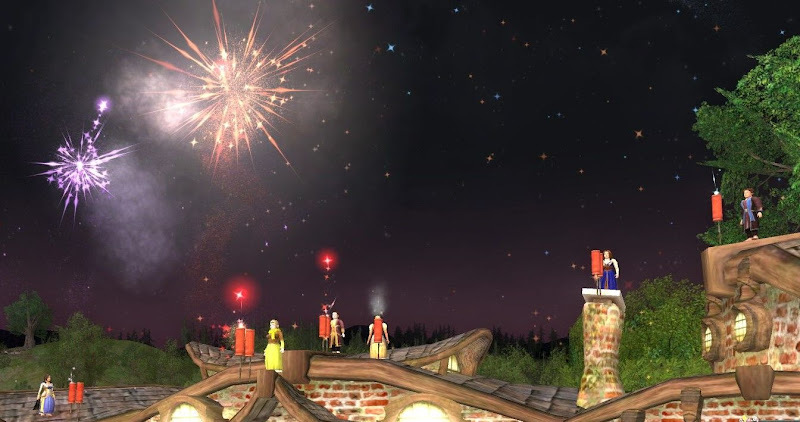 It's a great race, and completing the tutorial alone (30 mins of your time) makes you high enough level to walk to the green dragon safely, and become a true partaker of this great event series? I suppose to many this might seem very strange, Cymaru The Patient Pony waitress furiously wishing to have it more race-properly... In the Pony I roleplay with almost anybody, although I am quite picky and avoid roleplaying with elves and other very unlikely characters if I can. I am quite able to filter out characters that don't fit my LOTR world inside the Pony, because it is a collection of individuals who barely know eachother. And there is the major difference with the Green Dragon Fridays. The GDF group is a tight knit group of hobbity individuals who know eachother quite well. If you come in as a new hobbit you will be part of the group, simply because you're a hobbit. People are so kind there, it is a true gem on this server. For me, things go wrong the moment the Hobbit group seems to accept other races into the group as regulars. This way I cannot filter out the "unfitting" characters anymore, since the GROUP is interacting with them as if it were the norm. This is bugging me ever since I had a silly discussion with a regular elf who came dancing along every friday, she made me leave. There. I said it. I am still suffering from severe schedule mismatches regarding GDF, but should be able to participate more again in couple of weeks. Bonkadoc will have something pretty exciting to show everyone too! Excellent, master Bonkadoc! More taters please! While there's no telling what will happen on any given Green Dragon Friday (except much talk about food and complaining about ale prices), one thing is certain: There will be music, and the hobbits will dance. 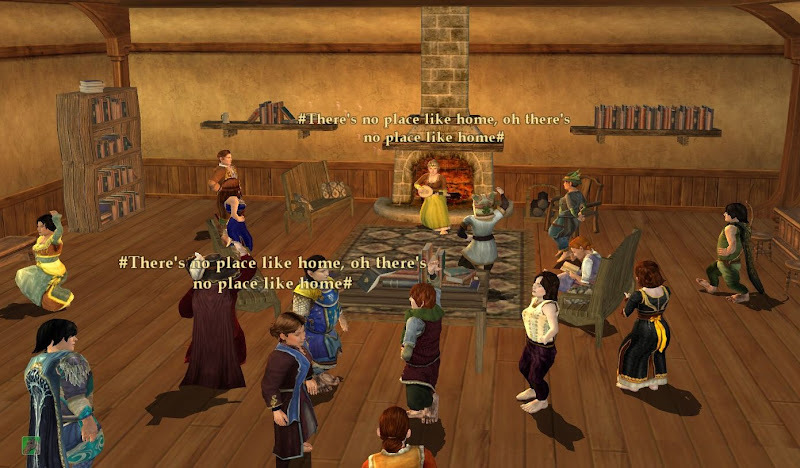 Always partial to lively dance tunes, like reels, jigs and waltzes, hobbits are rarely hard to ask onto the dance floor (although for some reason, lads are usually a bit harder to sway than the lasses). Most hobbits will play modest to begin with and claim they are not really good dancers. However, as soon as they get going, there's no stopping them, especially after they have visited the dance trainers during one of the seasonal festivals. After all, dancing is just stumbling in an orderly way, and the best part is that you can eat even more than usual after a lively night on the dancing rug. 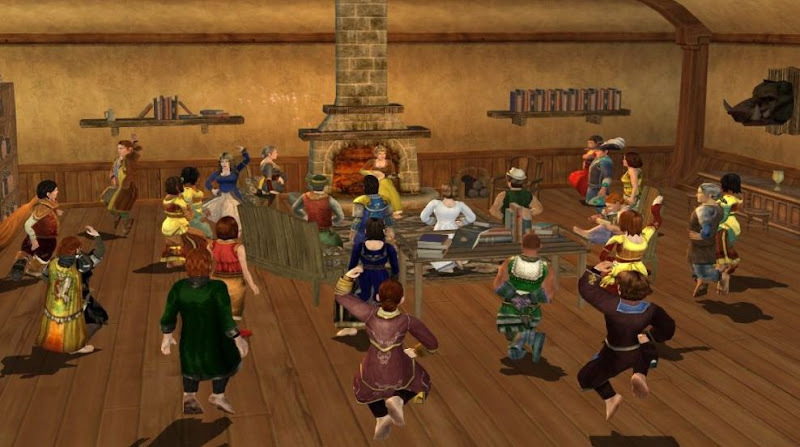 Recently, many hobbits have taken up the art of synchronized dancing, not least after many recurring dance practice sessions on Green Dragon Fridays. Ask one of the regulars if you want to try it yourself! Once again the week has turned full circle and it's Green Dragon Friday! Alas I will not be able to be there tonight and I have commitments elsewhere, but have fun! It is Friday, and as yer know, every Friday is Green Dragon Friday! So bring yer hobbits to Bywater this evening! (and do take a quick look at the guidelines for the event, as specified in the first post of the thread). Oh, and here's the latest Green Dragon Trivia! The Shire is home to many lovely songs and tunes, but over the years, few are as instantly recognizable as "Home Sweet Home". Not least because someone has taken to playing it every Friday, as a parting song after the end of yet another Green Dragon Friday. Where the song originated from is uncertain, some even say it has its roots out of bounds! Over the years, though, the words have been changed and adapted into comforting words suitable for Shire-loving hobbits, who join in the chorus before going home after another lively night at the inn. So stay until the end and sing along if yer like! Because be it ever so humble, there's no place like home! A grand time at the Dragon tonight; songs, news, stories, poems and the usual lovely banter. It even extended into a pie party at the homesteads afterwards. Good hobbity times! September 2nd is the date Tolkien passed away in 1973, and I pondered a bit on how to make a tribute to him without bringing his name into the game. The solution was a set of lyrics to the tune Planxty Fanny Power. Hope yer liked it! Sadly fridays ain't a good time for me to show up, but I try bringing melindy as often as I can to a green dragon fridays. You did great, Melindy! I hope you come back and play again. "If this hobbit goes with you, you will succeed. If not, you will fail. A foresight is on me, and I am warning you." You were grand, so you were. Look forward to seeing you again in the future. And as fer nerves.... *shudders* I know that one. Another Friday, and as yer know, every Friday is Green Dragon Friday! So up and at it, hobbits! In addition to the usual good-natured hobbit banter, news, music, poetry, riddles etc, there just might be dancing lessons too! Friday again, and it is business as usual in the Green Dragon. So bring yer hobbits over fer dancing and drinking and poetry and the likes! Oh, and as always, the latest in hobbit news. There should be quite a bit of it tonight! Just want to give this event a big thumbs up! I don't go as often as I would like but when I have done I have been amazed by the amount of hard work and dedication that goes into it. It is also the small touches that I love and for me there is no funnier than "Matzo Shenanigan", sitting on his chair and passing comment on everything going on. Absolutely wonderful!. For anyone familiar with the BBC Comedy Series "Early Doors" for me he is the Shire's own version of "Tommy". May this event continue to prosper and grow. Another Friday and another Dragon! Good times! There were many hobbits at the Dragon tonight, with a few wandering dwarves keeping us company as well! In addition to the entertainment (courtesies of Primmrose, Rhemo, Poffo, Sevelda, Lingard, Bordobac, Melindy, Jadite and The Chosen Few, apologies if I forgot someone), dancing (most everyone) and good-natured banter (well, besides that grumpy old feller...), we rounded the night off with a display of fireworks! 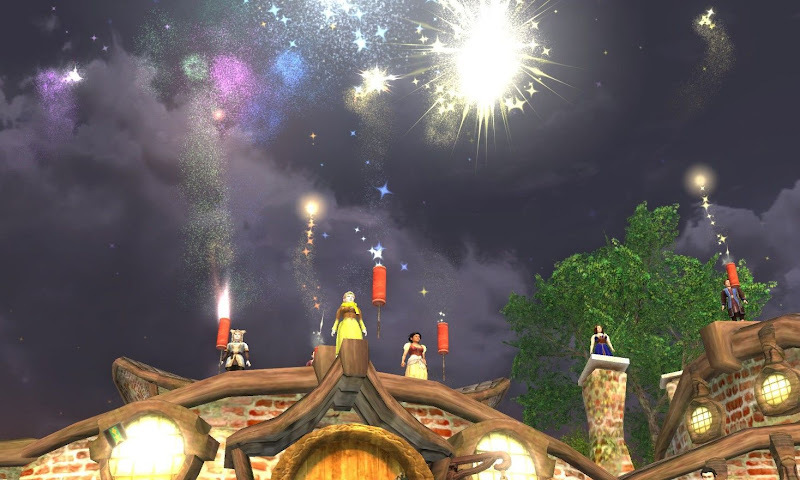 Anyways, here are some pictures from the fireworks display. OOH Lina, you forgot Primmrose, with another new song! But she forgives you, because she was on very early in the programme. I believe that is Master Trotgard saying it? And he does sum it up quite nicely. Grand! Another Friday at the Dragon! Should be a fine one too; songs and poems have already been offered, and there are news to gossip about. Welcome hobbits! would it be possible to get a short version of the shire-news? *drool* custard... any fish fingers? Well had a wonderful time tonight,was my first time and it was really fun.The time went bye so fast which was a shame. The bagpipes were umm an interesting addition and the jumping song was a giggle. Like to thank you all for running this event and the time and effort that goes into it that keeps it moving along and active.